Amir Hekmati is an American marine from Flint, Michigan who has now been held in Evin Prison in Iran without committing a crime for over 4 years. Balloons are released on the four-year anniversary of Amir's arrest during a gathering of many of his friends and family in Bay City, Michigan on August 29, 2015. In this screenshot from a July 14, 2015 appearance on CNN with Wolf Blitzer, my father, Congressman Dan Kildee, speaks about Amir's situation and pushes for action to be taken towards his release. Sarah Hekmati, Amir's older sister, takes a break from a busy day to send emails and make phone calls in regards to the Free Amir campaign inside a Tim Horton's in Flint, Michigan on October 27, 2015. A collage of photos taken by photographer Ashley Block depict Amir's family and friends in a jail cell. The photoshoot was arranged by the Hekmati family to raise awareness about Amir's plight. Photos from Amir's childhood show the happy, peaceful person Amir's family and friends know him to be. From left, Amir's mother, Behnaz, his niece, Maya, his sister, Sarah, his brother-in-law, Ramy, and his nephew, Sami, enjoy each other's company during dinner at Sarah and Ramy's home in Flushing, Michigan on October 29, 2015. 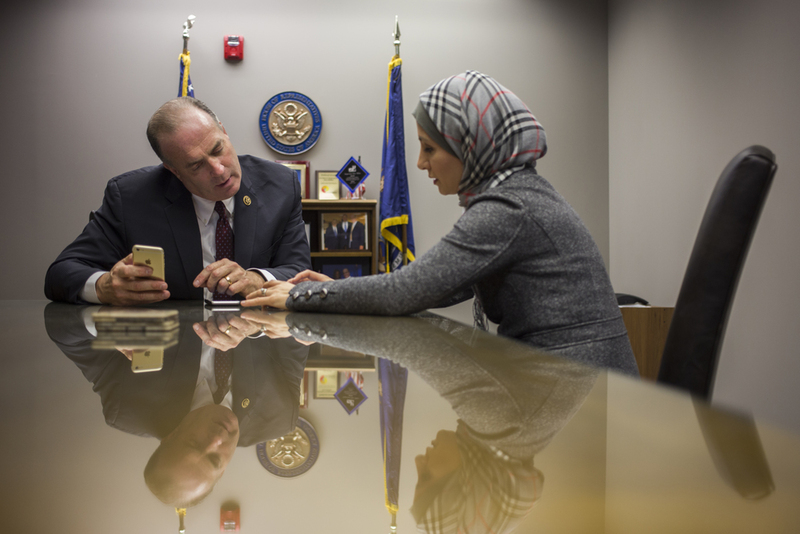 Sarah meets with Congressman Dan Kildee in his district office to discuss strategy for the Free Amir campaign in Flint, Michigan on October 30, 2015. "Free Amir" is seen on the side of Dunlop Motor Co., which is owned by a friend of the Hekmati family in Bay City, Michigan on October 30, 2015. Dr. Ali Hekmati, Amir's father, eats dinner in his apartment at Genesee Gardens senior living community as his wife, Behnaz, watches over his shoulder in Flint, Michigan on October 27, 2015. Maya, Amir's niece, lays on top of her father, Ramy, after the family enjoys dinner together in Flushing, Michigan on October 29, 2015. In support of the Free Amir campaign, 80 congressmen agreed to pose for a photo holding a "Free Amir" sign. A resolution asking Iran to release all four of the Americans they hold passed with 200 co-sponsors in the House of Representatives. Amir Hekmati, an American marine from Flint, Michigan, has been imprisoned in Evin Prison in Tehran, Iran for 1,527 days (that’s more than 4 years, and longer than any other American has been held in the country) after committing no crime. Amir is a son, a brother, an uncle, a friend, a lover of poetry and of culture, and an all-around peaceful and loving person. He served in Operation Iraqi Freedom from 2003 - 2004 and was awarded the Combat Action Ribbon and Good Conduct Medal. Amir graduated with honors from Monterey Peninsula College as an Arabic Linguist and has worked diligently to educate Americans on Arab and Islamic culture, in the hopes of breaking stereotypes of these groups and facilitating a better relationship between the U.S. and the Middle East. Amir’s father, Dr. Ali Hekmati was a college professor, and his mother, Behnaz, is a tax professional. Amir has an older sister, Sarah, and a twin sister, Leila. He also has a brother-in-law, Sarah’s husband, Ramy, and a niece and nephew, Sami and Maya. Ali and Behnaz moved to the US from Iran before their children were born and all of Amir’s extended family still live in Iran. When Amir traveled to the country in 2011 for the first time to meet his grandmother, he was arrested just days before he was to board a plane and come home. For four months, his family was left completely in the dark and had no idea where he was or what had happened to him. When they were finally contacted in January of 2012, after Amir was coerced into a false confession, they were informed that he was being charged with espionage and sentenced to death. Thankfully, a higher court overturned that verdict due to a lack of evidence in March of 2012. A new trial was ordered, but Amir waited, much of that time in solitary confinement, until December of 2013 when a secret, closed-door proceeding occurred, during which neither he nor his attorney were allowed to present a defense. Amir was then sentenced to 10 years in prison for “cooperating with hostile governments.” Under Iranian law, Amir is an Iranian citizen because his parents were born in the country. Simply by being an American marine, Amir became a traitor in the eyes of the Iranian government. Amir’s family has worked tirelessly to fight for his release. His mother, Behnaz said, “Every time we do anything, I think to myself, ‘I wish Amir could be here for this.’” Amir’s father, Ali, has been battling terminal brain cancer, and he fears that he will never see his son again. I also have a personal connection to the Hekmati family. Amir’s older sister, Sarah, and her husband, Ramy, have spearheaded the Free Amir campaign, along with the help of my father, Congressman Dan Kildee of Michigan’s 5th District. My father has made many efforts to spread the word about Amir’s imprisonment and to push for his release. Many times he has spoken on the floor of the House of Representatives holding signs that show the number of days Amir has been behind bars. He introduced and passed a resolution, with 200 cosponsors, calling on Iran to immediately release Amir and the three other Americans they are holding. He has met with Iranian Foreign Minister Mohammed Javad Zarif, Iranian Ambassadors to the UN Mohammad Khazaee (former) and Gholamali Khoshroo (present), Secretary of State John Kerry, and even President Barack Obama - several times. In those meetings he pushes for further action towards Amir’s release but also simply makes sure that Amir and his plight are not forgotten. He has also asked fellow members of Congress to pose for a photo holding a Free Amir sign, which approximately 80 members have done. Amir’s absence has had a unique impact on each member of his family, and his story has reached thousands of others. On July 14, 2015 a nuclear deal was agreed upon by the leaders of both countries, and there is hope that the relationship will improve and we will be able to bring Amir home. A bill was just introduced to the House of Representatives to form a coalition to monitor implementation of the nuclear deal, and this will create a direct avenue to push for Amir’s release. Until then, the Free Amir campaign is still at work. Bio: Katy Kildee is a 23-year-old photojournalism student at Central Michigan University and she is graduating with her Bachelor of Science in Photojournalism this December. She finds people and the world we live in fascinating, and photojournalism allows her to explore and learn. She has taken photos and video for The Flint Journal, Sitka National Historical Park, Interlochen Center for the Arts, Central Michigan University, Central Michigan Life, and the University of Michigan-Flint. She was also honored by the 2014 Michigan Press Association Better College Newspaper Contest. Upon graduation, she is starting a 6-month photo internship at the Saginaw News. She hopes to use photography to tell stories for the rest of her life, finding time in between for traveling and spending time with friends and family. Experience: This is the third time I’ve participated in the CMU Photojournalism Workshop, and each year the experience has been more impactful and beneficial to me as a person and photographer. This year I took on a story that I was personally invested in from the very beginning, and it was important that I had the support and guidance of Danny, Kent, and my fellow photojournalism majors. It is a very special feeling for all of us to come together with big ideas, work for a week to make them happen, and produce photo stories that matter to us and to our subjects. Together, we all become better. It is a humbling experience when a photo subject lets you into their life and trusts you to tell their story. I am proud of the work we have done as a group to tell the stories of immigrants all over Michigan and I’m excited to share it with you – thank you for viewing!